Montessori Kids Academy has been educating the local community since 2007. 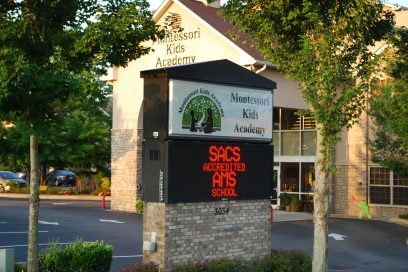 We are SACS Accredited and a full member school of the American Montessori Society. We started with only one Primary classroom and have grown to 9 classrooms that serve Toddlers, Primary, Lower Elementary, and Upper Elementary students (ages 15 months to 12 years). In 2011 we moved into our new building. It has been so wonderful to be able to grow to meet the needs of our families. It is very exciting to watch our students grow and thrive as they move from our Toddler classroom up to our elementary classrooms. We feel it is very important to build a strong relationship with not only our families, but also the members of the community. As a school, we strive to connect with people and partner with local organizations to give back to the community. We have had to privilege of partnering with organizations like Jump Rope for Heart, Children’s Healthcare of Atlanta, The Place, local food pantries, and many more. We are very excited about the new STEM curriculum that we have been introducing to our classrooms. We have been moving towards integrating STEM lessons with the Montessori way of teaching, which makes adding these traditional lessons a more seamless process. At Montessori Kids Academy, we believe in encouraging a life-long love of learning. We pride ourselves on being a community of learners, from our youngest students to our teachers and staff. Thank you for your interest in our school. We would love to meet you and your family. Please click the tour link to schedule a tour. The vision of Montessori Kids Academy is to establish and maintain authentic Montessori education for all children of our community. The school inspires productive global citizens by unlocking the potential in each child to become an adult of peace and understanding. We encourage and assist children to reach their true potential by recognizing individual learning styles, temperaments and multiple intelligence of children and then tailoring learning to each child.